Busy Lamp field (BLF) feature allows users to monitor several other extensions. The "Call Pickup” function is usually configured together with BLF allowing, for example, a receptionist to pickup ringing calls with a press of a single button. Note:Most phones are supported by the OnSIP Boot server and all BLF configuration should be done via the boot server configuration page under resources. However, SNOM phones are not currently supported on the OnSIP Bootserver and are therefore unable to be configured automatically and must be provisioned manually to take advantage of the BLF feature. The SNOM phone is not supported on the OnSIP system. The following information if available on an "as-is" basis. Technical support cannot help with the BLF feature on SNOM phones. Open phone administration in your browser (eg. Http://192.168.1.10). Make sure that the phone is running firmware version 8. 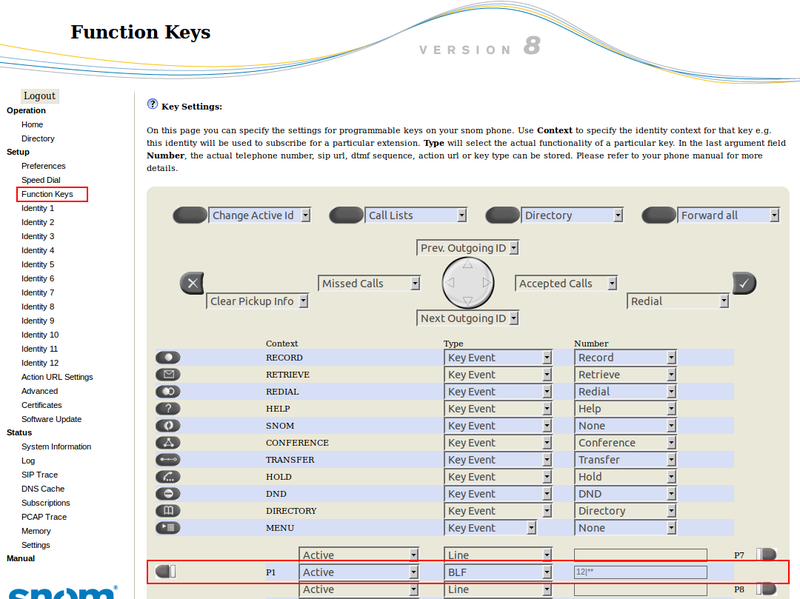 Configure BLF function on the buttons P1...Px.